Symbios Communications was founded by Stephen Ward. Having worked in the UK, Japan, and Australia as a technical and management consultant, he recognised the needs of many clients for more responsive, flexible, and cost-effective consulting solutions. Symbios Communications has published the 2016 update of the EO Handbook and associated database of EO missions, instruments and measurements. 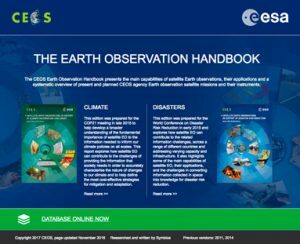 The full text and databases of Earth observation satellite missions and instruments and their applications is available on-line at www.eohandbook.com.